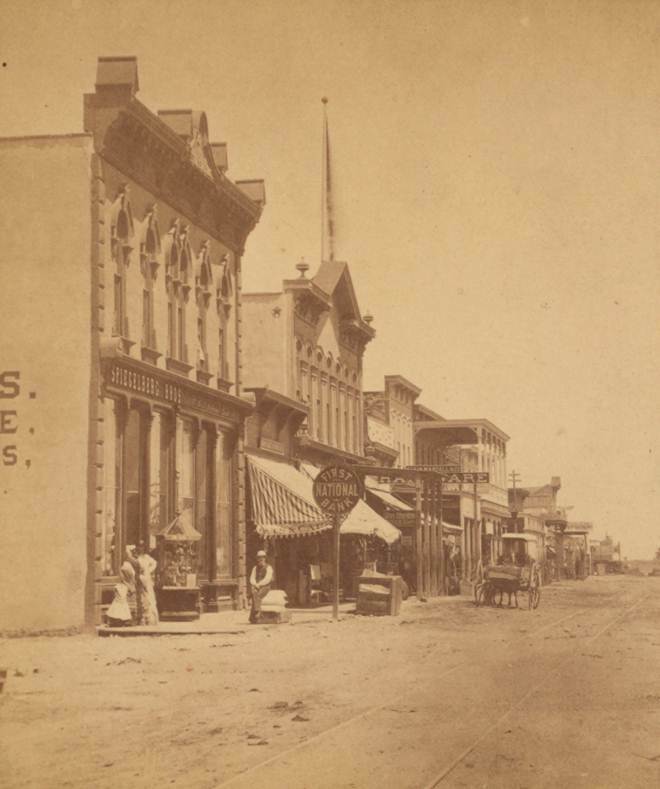 Ben Wittick took this photograph of a commerical street in Albuquerque, New Mexico, in 1880. It was produced as a stereograph card, a double image that people could look at through a viewer. Businesses line the wide dirt street, which has street car rails running down the center. A man can be seen sitting on a stack of (probable) grain sacks near a sign for the First National Bank, while nearby a woman and child look in the windows of a store. They appear to be wearing rather fancy clothing. Further down the street, a horse and buggy pass in front of a hardware store. It’s a placid image of daily life in Albuquerque, taken by the man who produced one of the most famous portraits in New Mexico history: Geronimo, leader of the Chiricahua Apache. George Benjamin Wittick (1845-1903) was hired by the Atlantic & Pacific Railroad in 1878 to document their expansion into New Mexico. He worked for the railroad until 1883, when he left to establish his own photography studio. 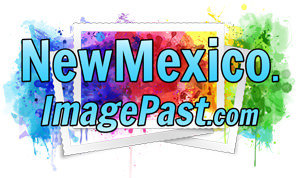 Over the years he had studios in a number of towns, including Gallup, Albuquerque, and his final studio at Fort Wingate 20 years after this photo was taken (the back of this stereograph card lists “Wittick & Russell, New Albuquerque, NM”). Wittick took many studio portraits of government officials and settlers, but he was particularly fascinated by Native Americans. He has been crtiticized for staging his studio photos, using props and backgrounds that created idealized, innacurate, and confusing representations of Native culltures. In the field, however, he photographed people as they went about their daily lives, carrying water, working at their looms, and other tasks. He was the first outsider to be given permission by the Hopi to record their ceremonies. He died in 1903 of a rattlesnake bite, a death said to have been foretold by a Hopi priest. Image Source: "Commercial street in Albuquerque." (G90F464_012ZF); digital images, "Miriam & Ira D. Wallach Division of Art, Prints & Photographs: Photography Collection; Stereoscopic Views of Towns in New Mexico," New York Public Library, New York Public Library Digital Collections (https://digitalcollections.nypl.org/items/510d47e0-95cc-a3d9-e040-e00a18064a99); crediting "Ben Wittick."